From the mountains of Ecuador to local shelters, Dr. Castro believes in sharing her expertise and abilities with those less fortunate. Giving back to the community is an important part of Dr. Castro's commitment to providing dental care to those in need. 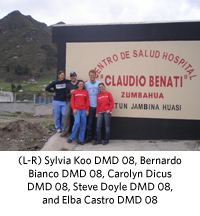 For two weeks, as one of the five chosen volunteers with Boston University Goldman School of Dental Medicine, Dr. Castro provided dental outreach to rural communities outside of Zumbahua in the Andes Mountains. During her visit, the group stayed at the Hospital Claudio Benati in Zumbahua. Each day they loaded a truck with materials, generously donated by Colgate, Dr. Wohl, and BUGSDM, and drove to schools located in rural areas of the Andes mountains, up to an hour outside of Zumbahua. Once they arrived, they set up chairs in the classroom and began screening and providing sealants to second and seventh grade students. Students from these two age groups were chosen because second grade is when children have their first molars come in and seventh grade is the last year of school that most children in complete. At the end of the two weeks, the group had provided sealants to more than 200 children. In her own community Dr. Castro also shares her concern for providing dental care to those in need, as a volunteer provider for the residents of the Loudoun, Fairfax, and Prince William counties. The Northern Virginia Dental Association hosted the Mission of Mercy event on March 13-14, 2015. Mission of Mercy is held at Northern Virginia Community College-Medical Education Campus in Springfield, VA. Dental screenings and services are provided on a first-come, first-served basis, at no charge to those who attend. MOM combines the donated services of hundreds of dentists, dental hygienists, dental assistants, dental lab technicians and an array of volunteers to provide these free dental services. It is estimated that over 900 underserved Virginians were treated this year, providing nearly $400,000 worth of free care. We hope to continue this tradition annually as it was a great success! Pictured are Dr. Castro and assistant Amanda. The American Dental Association began the Give Kids A Smile® program in 2003 as a way for dentists to join with others in the community to provide dental services to underserved children. The program initially began as a one-day event in February, but has since grown to local and national events year-round. Dr. Castro and other team members volunteer their time, and services, to provide screenings, treatment and education to children. Each year, approximately 350,000 children benefit from more than 1,500 events, all because of the efforts of 40,000 or more annual volunteers. The Northern Virginia Dental Clinic is a private non-profit 501(c) (3) organization. It was established in 1994 by members of the Northern Virginia Dental Society who wanted to contribute a critically-needed service to the community while preserving the dignity of the underserved. A unique, public/private partnership between dental professionals, local governments and social service agencies was formed. Dr. Castro volunteers her service and expertise to those in the community needing root canal therapy/surgery at no cost.